Flashing, blinking or just plain cool, we have the necklace to give you the grooviest look. Much more than just a necklace, this versatile halo-shaped tube can be used in all kinds of creative costuming all over your body! Fast-chasing LEDs look like they are shooting through the halo. Six ultra-bright LEDs encased behind a clear cover shoot patterns of light across the white surface of this necklace, dazzling you with a brilliant reaction that you won't believe! Show off your major bling with this unmissable gigantic dollar sign hanging around your neck. Huge 5" size! 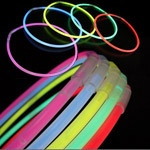 Glow Necklaces are 22 inches Long with a 6mm (1/4-inch) diameter. One color per tube. High-powered multicolor LEDs reflect off the inner mirrors to create a dazzling light show! These classy LED Beads are the coolest light up jewelry for celebrations and events. Multiple brilliant powerful LEDs in red, white, and blue flash various selections between various blink and chase modes. 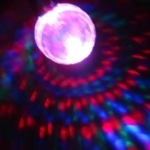 Create a dazzling array of multicolor strobing light patterns all around you from this large 2.5" diameter faceted ball. While technically a necklace, you can also swing the big ball around on the attached laynyard and create your own personal club lightshow that you can cast onto everyone around you! Rainbow Flower LED Leis are perfect for your tropical themed party, BBQ or luau. 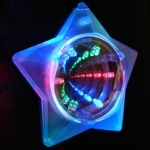 The popular infinity tunnel mirror effect is enhanced through LEDs that shine through the translucent points of the star. 6 flashing, color-changing, and solid modes to choose from. 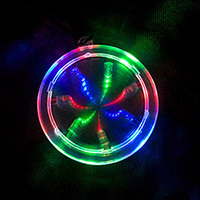 Creates a cool never-ending trail of light that seems to go on forever within the mirror surface.